They’re hard to miss – bright green bikes popping up on street corners across South Florida. People are calling them the Uber of rental bikes. NBC 6's Dan Krauth reports. They’re hard to miss – bright green bikes popping up on street corners across South Florida. People are calling them the Uber of rental bikes. You can use your smart phone to locate one, pay a dollar to ride it, and you can park the bicycle anywhere you want when you’re done. That’s causing a parking war in one local community. In the past six months, the Village of Key Biscayne, North Bay Village and Miami Shores have contracted with the California-based company called LimeBike for the new bike sharing service. Unlike typical rental bikes, the new rentals on wheels don’t have a lock or docking station. When a rider is finished, they can park the bike where they went, shut off the app and go on their way. The Village of Key Biscayne was the first to use the bicycles and now has more than 400 throughout the area. "You get cars off the road and people out and about, it’s a win-win," said Mayor Mayra Pena Lindsay. "It’s the next generation." However, in communities across the country, the dockless bikes have been found "parked" in many bizarre places. In Seattle, they’ve been tossed into the water. In North Carolina, one was found on the roof of a home. And in Key Biscayne, one was found in the bay. They’re not only getting tossed into hard to reach places. Some cyclists have chosen to ride them from the Village of Key Biscayne to Miami Beach, a city that has a contract with a different bike company. "Some individuals thought it would be fun to drive over to Miami Beach, it was too much work to bring them back so they were left there and I don’t think they were too happy about it," said Mayor Pena Lindsay. LimeBike is in charge of maintaining the bicycles and putting them back where they belong. 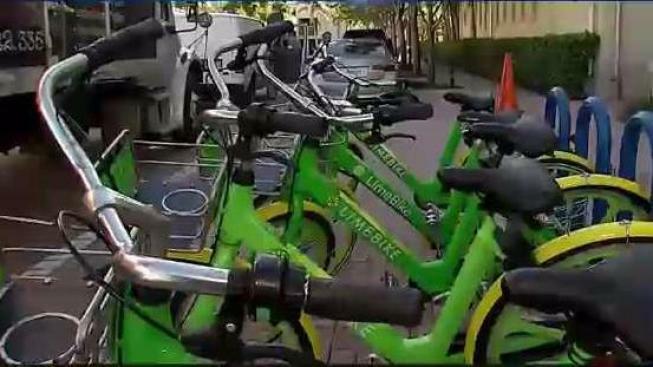 This summer the City Manager of Miami Beach sent a letter to commissioners calling the LimeBikes “rogue” and “illegal” and told commissioners the city would be issuing citations to the company. The NBC 6 Investigators found they’ve fined the company more than 30,000 dollars in the past four months. A bulk of the fines came from repeat offenses. A 3rd time offender can receive a violation of $10,000 for what the city calls "right-of-way violations." In an emailed statement, a spokesperson for LimeBike said they’re fighting the citations. 'We do not believe we violated any laws and are challenging the citations," the spokesperson said. "We are in discussions with the city attorney to determine whether we can resolve these issues, and are hopeful that a resolution can be achieved." The spokesperson also said "… it is also great to see how the local communities have embraced LimeBike." While some communities are testing out the new “smart” bikes, the Mayor of the Village of Key Biscayne says the program has been so successful, that they’re going to use the bikes on a permanent basis. She said there are no upfront costs to the Village, and the company handles all of the maintenance. NBC 6 reached out to code enforcement officials in Miami Beach but they would not speak on camera. They did say they could consider testing out the bikes as part of a pilot program in the future.